We see Duramax Diesel engines swapped into many different kind of vehicles but never a Sand Rail. The guys at Merchant Auto in Zeeland, Michigan crammed a 6.6 liter Duramax Diesel engine into a sand rail to compete in sand drag competitions. The massive torque numbers of this engine make this sand rail a beast wherever it goes. We have seen it run everywhere from on the Asphalt at the dragstrip to the Sand Drag Lanes in Michigan. This time the Merchant Auto guys were rolling coal at the 2014 Griztek snow challenge in their 700hp Duramax Diesel Sand Rail. The engine features 200 pound injectors, a beefed up turbo, and Stroker CP3 fuel pump, while the block was got a set of aftermarket head studs. The 700hp engine is backed by a 2 speed power glide and a beefy trans-axle to deliver the power to the massive scooped rear tires. While the vehicle was a little low on ground clearance for the snow it still pulled out some wins and the crowd loved seeing the big clouds of black smoke. For more diesel videos check out the Busted Knuckle Video Youtube Channel. 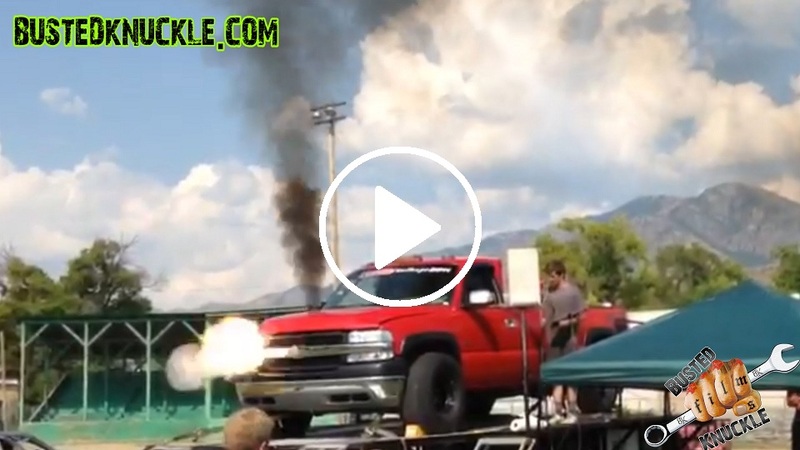 This video shows the limits of a Duramax Diesel Engine…BOOM! That’s one bitchin sand rail !!!!!!! !